Group pictures from Division and District contests. 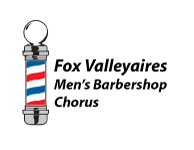 Fox Valleyaires Chorus at the Land O Laked District Chorus Competition October 2015 in Oshkosh WI. The Fox Valleyaires at the Land O Lakes District Chorus Competition, October 2016 in Appleton, WI. The Fox Valleyaires at the Land O Lakes District Chorus Competition in October 2017. The chorus won most improved chorus.